1 of 4 Heat oil in a large skillet over medium-high heat. Toss beef with 2 tbsp of the flour, 1/4 tsp of the salt and the pepper. Add beef to skillet and brown on all sides, 5 minutes. Remove from heat. 2 of 4 Meanwhile, coat a 4-quart slow cooker bowl with nonstick cooking spray. Add mushrooms, onion, carrots and garlic. Season with remaining 1/4 tsp salt. Stir in broth and wine, then browned beef. Cover and cook on HIGH for 5 hours or LOW for 7 hours. 3 of 4 Scoop 1/2 cup liquid from slow cooker and whisk in remaining 1 tbsp flour. 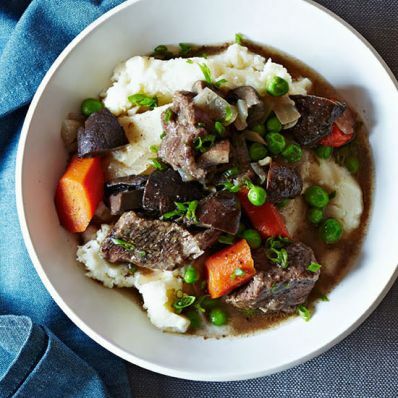 Stir back into slow cooker along with thawed peas and 1 tbsp of the chives. Cover slow cooker and keep warm. 4 of 4 Heat potatoes as per package directions. Stir in remaining 2 tbsp chives and 1/4 cup warm water. Spread potatoes over filling and serve.